Advent has been celebrated by many Christians throughout the centuries and across many cultures. The word comes from the Latin adventus, which means arrival. In a general way, it simply refers to the arrival of something such as a notable person or significant event. For example, the advent of the Beatles; or the advent of space exploration. In Christianity, Advent celebrates two things: 1) the arrival of Jesus Christ at his birth and 2) the arrival of Jesus Christ at his return. 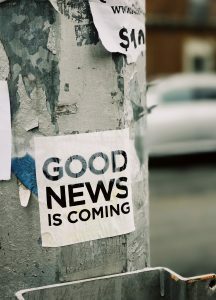 So, it is a season of Good News! We all long for good news. We want our favorite team to win. We hope the surgical procedures is successful. We look forward to joy-filled moments. But each also has the possibility of loss, failure, and absence. The greater potential for loss corresponds with the greater potential for celebration. We all like good news. If we miss the big game, excitement builds within us when a friend texts the final score. Relief flows from us when we hear that the surgical procedure worked. Joy radiates out of us when we experience happy moments with the ones we love. Advent is directing our attentions on God’s redemption through the coming of the Promised Messiah. The reach of Jesus Christ’s arrival extends as far as the curse is found! Oh Jesus, you have come, and we long for you to come again. How to Find Sermons on the New Website?